In any modern browser, you can highlight a word or phrase, right-click it, and choose to search for more information on those specific terms. Now you can do it in Microsoft Word, as you write. When you right-click a word in Word Online, Microsoft gives you several options, including cut, copy, and paste, the ability to add a hyperlink, and more. With the new addition, choosing Insights will bring up a right-hand sidebar that Microsoft says will offer up information from Bing Snapshot, Wikipedia, Bing Image Search, and more. Bing scans your text so that it knows you’re looking for apples, rather than Apple. There are several ways to tap Insights for Word Online. Essentially, Insights represents a Bing search bar for Word. And if that wasn’t clear enough, Microsoft has tweaked the functionality of the “Tell me what you want to do” (aka “Tell Me”) box at the top of the page—which was already a search box, basically—and added the Insights feature to it, too. Unfortunately, Insights appears to be an online-only feature for now. Microsoft hasn’t added it to its Office 365 roadmap, although some of its other improvements will migrate to Office 365. Microsoft also solved one of the small annoyances that accompany Adobe PDF files: embedded images, which themselves contain embedded text —a photo of a restaurant menu, for example. 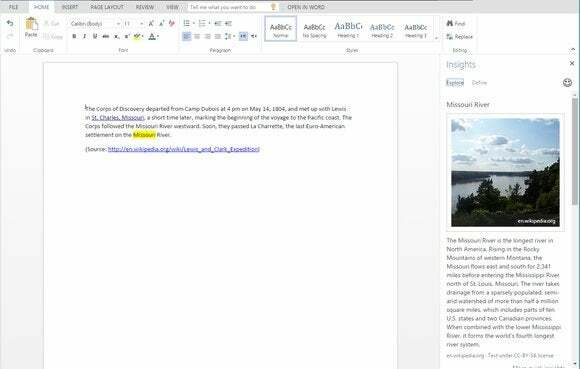 Using Microsoft’s Office Lens technology, Word Online can now scan those images and extract editable text. You can even search your document, and Word will find “Duck a L’Orange” in the embedded text. Even better, you can convert a PDF to an editable Word document, and edit it. Word saves the formatting and layout. Microsoft’s Tell Me box has also been improved, as it acts more like a search box. Microsoft’s Word Online also includes other improvements: pagination, with visible page boundaries; and new support for symbols including £ or ¥. You can also ask the Tell Me bar for your document word count, although Word already displays that information at the bottom of the page. But Tell Me also exposes related commands, too, even those that may have been hidden by sub-menus. It sounds remarkably similar to the way search works in Windows 8 proper, where you can search for “Bluetooth settings,” for example, and jump right to that menu. Still, Office Online remains its own product, a free derivative of Office that is both further advanced and somewhat behind what Microsoft offers on Office 365 or in its standalone software. At some point, Microsoft may collapse the versions into a unified experience. For now, however, diversity rules the day.